The present R.E.D. Classical 1999 (formerly Gramophone) catalogue lists 30or so recordings of Elgar's Cello Concerto. So, one may well ask what is so special about this new entry into an already crowded field. Well, there are a number of good reasons: it is a recording made by non-British artists, it is distinguished by adventurous booklet notes (including a lengthy essay by Wispelwey on how he prepared for the recording) and unusual programming - whereas the majority of recordings opt for safe couplings with standard popular repertory works or inclusion within easier 'concert' programmes, Channel dare to couple this performance with Lutoslawski's Cello Concerto to form an intriguing and dramatic contrast. I can think of only one other such adventurous coupling - the Revelation recording (RV10100) with Britten's astringent Cello Symphony. Wispelwey tells us that he listened closely to many recordings of the Concerto before he entered the recording studio; and he notes the differences between the Elgar-Beatrice Harrison and the Du PrE9/Barbirolli readings. Of the Elgar/Harrison recording he comments: "Perhaps not the perfect chemistry between conductor and soloist, but how refreshing are Elgar's choices of tempo, how flowing the Moderato (and moving and magisterial and elegant), how playful and lively the fast movements and how natural the Adagio!" Wispelwey appears to have deeply studied and thought about his interpretation of the Concerto. He makes interesting detailed comments about several passages. For instance: "It is remarkable that, although the concerto's idiom is unambiguously late-romantic, there is such control. This is expressed, for example, in a term such as 'nobilmente', applied to the opening measures of the cello in the 1st and 4th movements. .All the more overwhelming is the moment in the last movement where Elgar loses his gentleman's self-control and lets himself go in Wagnerian outbursts, leaving the cellist in harrowing isolation. Before he finds comfort in a quotation from the 3rd movement, there are four measures leading to this moment which sound like Brünnhilde's gradual surrender to sleep at the end of Die Walküre, underlining the valedictory atmosphere of the whole episode, and perhaps of the whole concerto." Wispelwey, playing on a 19th Century French (anonymous) instrument, begins a little tentatively and carefully; this is a studied rather than a spontaneous reading but with no lack of warmth. Surprisingly, the tempo is slightly faster than that of the Du Pré/Barbirolli partnership. Jan van Steen provides a most sympathetic accompaniment and the rapport and integration between soloist and orchestra throughout is excellent. Wispelwey's playing is always clean and articulate impressively so in the faster moving sections of the Lento-Allegro molto. The Adagio (4:31) is again faster than Du Pré(5:15); it is as though the sadness is being recollected at a greater distance; suffering recalled in greater maturity, but it is no less affecting. I was reminded of Wispelwey's comments about Wagner quoted, while listening to the fourth movement (Du Pré: 12:15, Wispelwey:11:09), the orchestral response is harder and tinged with bitterness while Wispelwey's mourning has more of a defiant edge. 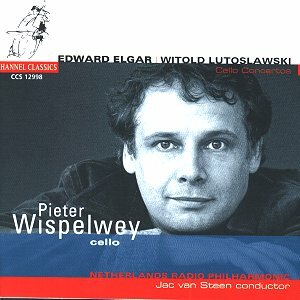 The contrast between the Elgar and the Lutoslawski is stark indeed. This is uncompromisingly modern and music (composed in 1970), appeals to the head rather than the heart. (Would Elgar have commented: 'all mechanical, no romance', I wonder). Again Wispelwey gives an excellent commentary about the work persuading us that it has drama, intensity and humour. The effects for the cello impress and the orchestral textures are colourful and often arresting. The concerto begins with an extended cadenza, a showpiece for off-colour glissandi and other typical Lutoslawski devices. The cello's meanderings are interrupted by a series of trumpet calls which are reminiscent of a cacophony of impatient car horns. These horns dominate this one-movement work which continues through a thicket of weird string pizzicatos and isolated, seemingly uncoordinated percussion strokes... It is only well into the work when the cello muses melancholically over quietly, agitated strings that we approach anything like Elgar's sound world; but this atmosphere is soon dispelled by the orchestra's eerie unease. Despite my usual resistance to this type of music, this work grew on me after several hearings.